Disney has a lot of games available for Windows 8 users and one of the first ones that was released in the Windows Store is Where’s My Water? Now, the game has been updated, according to the release notes, with mouse wheel support and improved performance. Having received so many awards, this is a game you should miss for your Windows 8 tablet. Countless hours of fun with Where’s My Water? Swampy the Alligator lives in the sewers under the city. He is a little different from the other alligators — he’s curious, friendly, and loves taking a nice long shower after a hard day at work. The other alligators have damaged his plumbing and disrupted the water flow. Help Swampy by guiding water to his shower! In Swampy’s Story, play ten themed chapters over 200 levels. 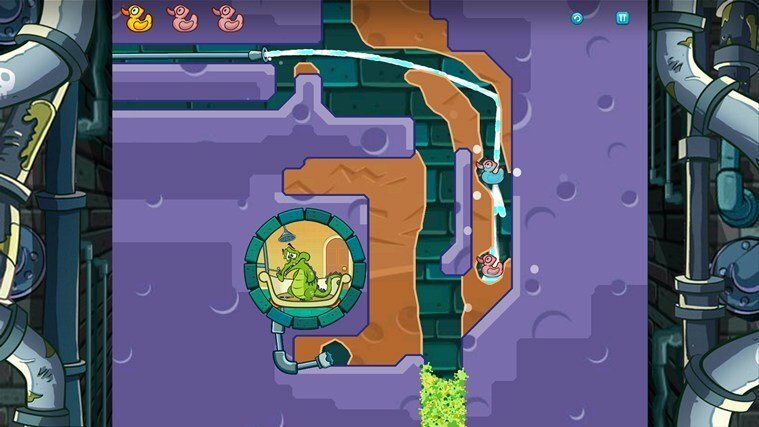 Collect Swampy’s ducks and shower items to unlock new puzzles and bonus levels. There are 3 stories, 3 separate games and more than 400 total puzzles that expect you to solve them. If you will finish Swampy or Cranky’s story mode, then you can proceed to Mystery Duck levels. The fact that the game has been updated with mouse wheel support makes it equally enjoyable on a Windows 8 desktop device, albeit the best fun is when you play it on a Windows 8 or Windows RT tablet. Hit the link from below to download it.